02/20/19, 06:24 AM | Industrial Robotics, Factory Automation | Piab Inc.
Piab introduces the next generation piCOMPACT®23 with new SMART features included..
t-Sort Plus is a new product offering in the t-Sort unit and parcel sortation system suite. 02/18/19, 08:10 AM | Industrial Robotics, Factory Automation | Servo2Go.com Ltd. The actuator is constructed with a direct drive brushless servo motor. It's designed with linear guide built-in lubrication to offer long life cycle. VadaTech, a leading manufacturer of integrated systems, embedded boards, enabling software and application-ready platforms, announces the ATC500. The ATC500 is an AdvancedTCA Blade with two XCVU13P FPGAs and multiple ADRV9009 for Wideband Massive MIMO Software Defined Radio. 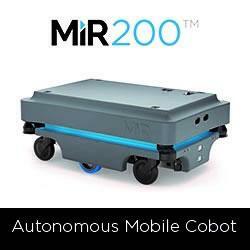 According to Ultra Tech Automation, Manufacturers Are Paying a Price-Cost, Status, Lack of Innovation-Because They Don't Know How to Effectively Deploy Their "Cobots"